I'm back on my kick for combining genres. This time I'm focusing on the "Traitor to the Crown" series by C. C. Finlay. The series takes place during the American Revolution and follows the hero, Proctor Brown as he develops from a young farm boy with patriot leanings to a major force in the War for Independence. He does this because he is a witch. Finlay doesn't present an alternative world, he uses the one we live in and know from the history books. However, he adds the detail of witchcraft to explain some of the events which took place. In The Patriot Witch we are introduced to Brown who is a young farmer in love with a Tory girl. He has some magical abilities but because of the treatment of witches, he has kept it hidden. But war is coming and he is drawn into the fight. He is also drawn into a world of witchcraft he didn't know existed. As the war flames into existence, he learns about a shadowy group of witches who are determined to see the Americans lose. It is up to him and a small group of witches to defeat their magical enemies to see the Revolution successful. The story continues in the next book, Spell for the Revolution and concludes with The Demon Redcoat. What I find fascinating with this series is not the witchcraft element but rather the use of witchcraft as an explanation to the some of the events in the war. If you've read anything about the escape from New York by Washington and his troops, you know how impossible a task it really was. Finlay uses magic to explain how this miracle happened. The books are shelved in the sci fi/fantasy section of the bookshop, but really these are more historicals with a paranormal element. If you don't like history, you are not going to get as much from this series. Real historical figures are important characters in the novels and significant happenings in the Revolution are a major part of the story. As I have said before, I am all for finding new ways to invigorate the historical. What I like so much about this series is that it isn't a changing of history but rather a new way of telling it, a way of making it a little more adventurous. Hopefully this blending of history and magic will bring new readers into both genres. People who are not history readers might have their eyes opened and gain an interest in reading more. Others who read for the history may find the elements of the paranormal something fun to delve into. As a writer, I like the idea of authors leaving the narrow path and creating a blend which appeals to all kinds of readers. I recommend this series to history buffs paranormal fans alike. It brings to life a great period in history while giving it an entertaining edge. Awhile back I posted about blending the paranormal with historical fiction. In Gail Carriger's Soulless I find a charming example of what I mean. The heroine, Alexia Tarabotti, is a Victorian spinster who has no soul. Truly, it isn't as dark a premise as it sounds. In Miss Tarabotti's world, vampires and werewolves are beings with too much soul. Thus, when they come in contact with Alexia, she neutralizes their powers and for the duration of her touch, they are once again mortal. 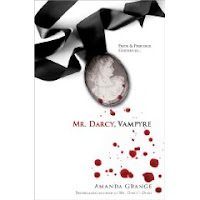 The novel opens up with her being attacked by a vampire who is not in the know as to who she is. After she is forced to kill her attacker, she is confronted by Lord Maccon, alpha werewolf and an authority with the Bureau of Unnatural Registry. He is also handsome, outrageous and far too rude for Alexia's taste. The story follows a mystery about the disappearance of certain vampires and werewolves. She is warned by Lord Maccon to stay uninvolved, but of course she involves herself anyway. She is a logical woman and it isn't as if she dives in stupidly. Her soullessness does keep her safe from the monsters to a certain point. It also keeps her in Lord Maccon's company more than she would like, or so she says. Thrust together into some very discomfiting circumstances, they search for an answer to the disappearances and must fight the evil responsible. Soulless is charming. That's the appropriate word. And fun. Although the story revolves around monsters, the tone is light and the book doesn't take itself too seriously. Because as much as this is a paranormal/urban fantasy, is is also a comedy of manners. The historical context of the story is vital to it. Alexia is as perturbed about the cheap clothing the attacking vampire wears as she is about his actions. Her being half-Italian is as much of a concern as her soulless state. Silly really but it plays into the comedy of Victorian society. The attraction between Maccon and Alexia is also delightful. She is always aware of her behavior and strives to maintain respectability whereas Lord Maccon is far too rough around the edges to care. This contrast in behavior is of course which makes them combustible together. I don't want to say too much because it would be easy to spoil this book and I don't want to do that. Ms. Carriger has brought a unique blend of genres to the page. Historical romance, paranormal and fantasy all blend into a smooth story. To squeeze Soulless into one genre is not fair to the book. However, I do think most readers of historicals and historical romance will be enchanted by the story. The dialogue is funny, reminiscent of true Regencies where the rules of Society are played for their ridiculousness. There is a steampunk flavor, but Ms. Carriger isn't bludgeoning her readers with the theme. Nice touches without losing focus on what the story is. If you are looking for a light read, some romance, some thrills, Soulless will fit the bill. The next book, Changeless is out in May and I can't wait. And if you have a chance, go here and play with the Alexia Tarabotti paper doll. Here's a multiple choice question for you. What I'm getting at here is a question that has been a part of the historical fiction writing world for a long time. If you're writing a historical, just how accurate do you need to be? There are some purists who refuse to use made-up places, insisting that if it's "historical" than that place really needs to exist. The other side of the coin gives you more leeway. To use our example above, using a made-up village enables us to be completely free of error - i.e. you're not going to have anyone calling you up and saying, "But the village bakery isn't on that street!" or what-have-you. This is a bit different when you get to bigger locales, however. Using major cities as locations is much easier. You have access to a lot more research, and though chances for errors are still possible, they're not as easy to make. But...if you're writing a historical, are you cheating the reader by setting it in a fictional place? It isn't a particularly new trend, but it seems to be growing in popularity. While paranormal romances and fantasy fiction have soared, it seems as if the paranormal is finding its way into the historical. I'm not talking about the Pride and Prejudice Zombie thing which is parody and not really a true blend of genre. 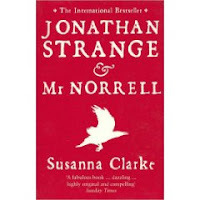 I'm more interested in books such as Suzanna Clarke's Jonahtan Strange & Mr. Norell or Amanda Grange's Mr. Darcy, Vampyre . Why is this popular? Any thoughts? I think this is a trend which will grown more into the mainstream of historical fiction and historical romance. Will it help or hinder these markets? Will it become a more solid sub-genre? I'm not even going to go into Steampunk which I think is poised for an explosion and I think it is worthy of its own post. But do you agree there is a growing trend? As a historical writer, are you open to adding paranormal elements to your writing? As a reader, is this violating the purity of the genre? It's no surprise I have a degree in history. I spent my college career researching details until I could go no further. A proper historian grinds and grinds because we certainly don't want someone saying we are wrong or we didn't find that one glaring detail which would change everything we presented. In academia, that's pretty important. In historical romance? We try to be as accurate as we can. I've been known to spend days trying to figure out if the word "chandelier" was used in the 18th century. Or if someone living in London would have a water pump in the house or would they need to go to a public pump. As details go, these are pretty sniveling and really shows how a historian type can get bogged down. Most readers aren't going to know and even if they did, it isn't going to affect the story. My new rule of thumb is if I can't find the answer in five minutes, it probably doesn't matter. Unfortunately, I hold other authors to the same standard. If I can find the answer in five minutes, they should have too. This is where I'm probably unfair. There are details which our society assumes are correct and no one would think to check it (except for me). For example let's take cotton fabric. When we think of cotton we think of cheap material. We think of those old time calicos or the denim jeans we wear. Our undergarments are made of cotton. So wouldn't it make sense that poor or lower class characters would wear cotton? Except that the cotton gin hadn't been invented until 1793. Previous to that, cleaning the cotton from its seeds was a difficult, laborious process there for the fabric was prohibitively expensive. Therefore it was a fabric for the rich. So is this important? Does it impact a story? No, not really. Not many readers are going to make the connection. There are far worse mistakes to make. And there are some historical facts which can be used where a reader through their perceived sense of history are going to think are dead wrong. I once used a certain swear word in a WIP and got criticized because it was too jarring and certainly couldn't have been used at that time. Sorry folks, it wasn't a cuss word until later in the 19th century. You can find it in court records as a regular ol' descriptive word for intimate relations. Or having an unmarried woman use the title "Mrs." If my heroine is a housekeeper or a professional woman of some respect, she will be called Mrs. no matter her marital status. But most readers won't know that and I would have to spend precious words on an unnecessary infodump. I think the problem is that worrying about the small stuff can bog down the writing or, and I've read it before, can make the author look like a show off. The amusing thing is, as curmudgeonly as I am about historical accuracy, one of my favorite historical romance authors from the '80's wouldn't have known an accurate historical detail if it bit them on the nose. However I was so engaged in the story and the characters, I had no problem ignoring it. And that's the crux. If the writing is good and entrances the reader, then the small details don't stand out so much. But as writers obsessed with history, where do you draw the line? I've always loved reading novels set during the Revolutionary War. The struggle of a young nation against one of the most powerful armies on Earth makes for a thrilling read. That's why I was quite excited to pick up Christine Blevins' new novel, The Tory Widow. Set in New York during the early days of the American Revolution, this lush historical novel tells the story of Anne Merrick, a young widow whose elderly husband ran a Tory printing press. After his death, she's struggled to make ends meet, even if it means printing opinions she doesn't agree with - mainly those that support the King of England. Jack Hampton is a staunch patriot and participates in a raid that ransacks Anne's home. The spark between the two flares to life and Anne becomes involved in the Rebel cause - and opens her long-closed heart to Jack. 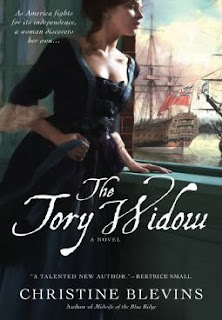 From the first shots fired at Lexington and Concord to the occupation of New York by the British, The Tory Widow weaves a complex and intimate story of two people in a tumultuous time who find liberty and love. What truly struck me about The Tory Widow was the amazing amount of historical detail Blevins included. It literally appeared as though she stepped back into time and sat and recorded all that she saw. I can't imagine the immense amount of research she must have done, but the effort was well worth it. She describes the printing process in fascinating detail and perfectly captures the mannerisms and attitudes of the time. Jack and Anne are wonderfully complex characters and I thoroughly enjoyed watching their relationship grow. There's a great cast of secondary characters - Titus, a black man who becomes Jack's best friend; Sally, Anne's Scottish maid; David, Anne's brother and an officer in the colonial army and Sally's beau; and even George Washington himself. This is the first book in a three-book series on the Revolutionary War and I must say, I can't wait until the other two books come out. I was completely swept into this world and am looking forward to what happens next to Jack and Anne. I've been in a little bit of a writing funk. Not a bad one. I'm just tired of what I've been writing. I imagine it happens to everyone. I crave a world different from the one I've been writing in. So I've been toying around with a historical romance I started awhile back. It's tough to get back into it after spending so much time dedicated to a contemporary world. My voice doesn't change, by my style does. Essentially, I run the words through the "translator" in my head and write them down. Takes longer. I need a dictionary and a thesaurus nearby to find the words and find out if they existed in the time period I'm writing in. Research is tough because I can't make it up as I go along, but honestly, I've done so much research, that really isn't all that hard anymore. Anyway, I started this blog a long time ago when I was writing historicals and now I've decided to revive it in the hope it helps keep me focused. I'll post tidbits that I find and explore the particular issues that go along with writing the historical novel. For those of you who are interested either as readers or writers in historical fiction and romance, what issue do you feel are important? Is there something missing you'd like to see? Too much of something? A Little Cheese with that Whine?